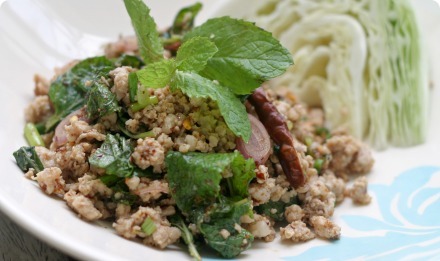 Laap (larb, laab) is a Northeastern (Issan) and Lao dish which, like som tum, is popular all over the country. It usually consists of cooked ground meat which is tossed with lime juice, chili powder, fish sauce & toasted rice powder, along with long coriander and mint. Boil the water in a saucepan and add the pork. Break apart and stir very gently until it’s cooked through. Strain and add to a bowl. Let it cool to slightly warm or room temperature. Add the chili powder, sugar, lime juice, toasted rice powder, fish sauce, mint, scallions, shallots and long coriander to the bowl. Stir well. 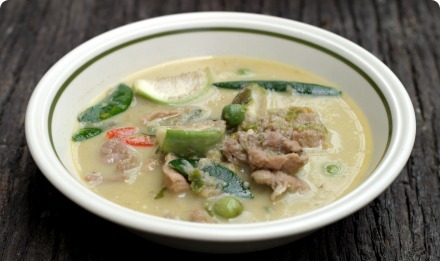 When i was in thailand we ate laab ped a lot but it was made slightly differently to laab moo/gai/nuua. It was fried with garlic and tasted great, if you know how to make this and could put the recipe on here that would be awesome! This is such a wonderful website with beautiful pictures. 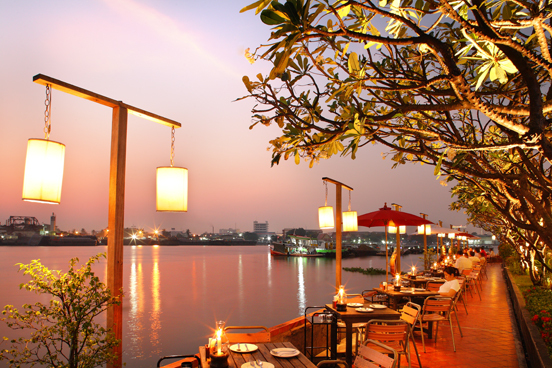 I’m cambodian and I love thai food. Thank you so much for sharing these recipes!!! I’m so excited to start cooking some of the stuff on here, starting with laap. Can´t stop eating this stuff tastes so good, but beware very very spicy, like burning and water does not stop the burn ongly good beer. This has got to be my all time favourite Thai dish. I remember eating it in Thailand with my mouth on fire unable to stop as it tasted so good. Are you sure there shouldn’t be more chili, though? All the other recipes from Real Thai Recipes that I tried so far were *really* spicy for my taste (especially the Som Tam – up to 10 small thai chilies for one serving, are you insane??? ;-), but I tried this Laap recipe yesterday and didn’t find it spicy at all. Is it possible that the dried chili powder I bought from my local Asia store isn’t as spicy as it should be? Is it possible to manually dry fresh thai chilies? 1 tsp if chili powder is a lot – if it is not spicy for you, you must not be using the correct chili powder. Try a Thai brand if you can find it. It is possible to manually dry the chilies, best done in the summer sun. Is the one you have a finely ground powder, or is it more like little flakes? If you click on the chili powder in the ingredients list above, you’ll see a photograph of the type of chili powder used in the recipe. The Laap I had in both Thailand and Lao (I refuse to use the ‘s’) were not that spicy and certainly no where near as spicy as any of the Som Tam I had there. But you can always season to taste. Oh, and another question: The Asia store didn’t have mint, so I did the recipe without it. Today I found that one of the local supermarkets near me has fresh peppermint leaves, could that be used or is it a different kind of mint? I am not sure in English which type of mint is used in Thailand. Perhaps spearmint? Yeah, it’s probably spearmint, thanks. How much is 1/2 cup ground pork? Over here, meat by is measured by its weight, not by its volume.